The opening of (El) Arepazo is of interest for at least three reasons. 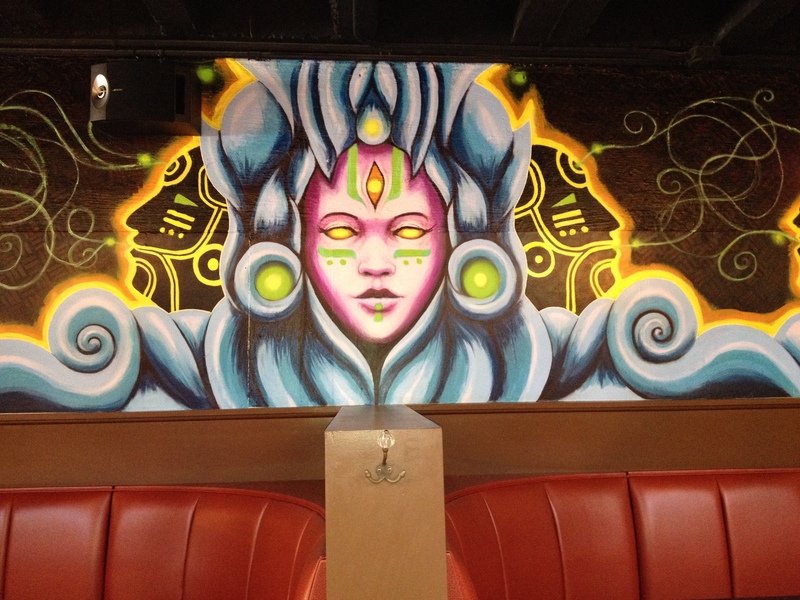 First – the authentic Venezuelan and South American themed menu is amazing. Second, owners Carlos and Carolina Gutierrez have a great story of rising from rags to (someday) riches in Columbus. Third, this new location in the Brewery District (their third) may mark the tipping point for the third renaissance of the Brewery District. I wrote about the couple in the early days of CMH Gourmand when they had just one location located in Pearl Alley. The couple were early adopters of the alley as an area to grow a community and it certainly has changed a lot since they opened there in 2005. Their next move was to go mobile, which I detailed in this post from 2011. They opened a second location in Gahanna shortly after and they just sold the trailer a few weeks ago. The Brewery District location debuted at the end of August and is drawing in some good foot traffic is a short amount of time. The Brewery District location is distinctly different from its sister restaurants. There is a lot of space inside and a nicely sized patio on the outside. There is a small takeaway / grab and go counter where you can score some of their addictive cilantro sauce, a dessert or some small dishes to go. Another corner has a pool table for those that would like to linger on between meals of cocktails. The bar space is ample with plenty of room to spread out while exploring the world of latino cocktails such as Mojitos and Caipirinhas. Unique to this space is a larger party room with an extensive wine rack which the couple plans to stock deeply with South American wines. All of the aesthetics aside, they did a great job to create a fun space to enjoy a wonderful menu. As for the Brewery District here is a quick history. The area supported six breweries in its heyday, the age of the beer barons on the 1890’s. Prohibition marked the official end of the prosperity of the area although the area started to decline in the early aughts due to a combination of increased competition from Cincinnati and out-of-state breweries, the Anti Saloon League, labor strikes, the “drying of Ohio” as well as grain rationing and anti-German sentiments during World War I. The second renaissance of the area was in the 1990’s when the Hoster Brewing Company Brewpub was the place to eat and drink and a string of bars led by Gibby’s, Victory’s and Hi Beck Tavern drew the masses to the city’s south side. The opening of the Arena District and Easton caused an entertainment ADHD which drew visitors away from the area and closed many businesses that had once thrived. This third renaissance officially (according to me) started this year. While Columbus Brewing Company Restaurant, Shadowbox and World of Beer have held their own and kept people in the area, a burst of new blood entered this year starting with Brick (and American Kitchen) in the former Handke’s location and now El Arepazo. Some other spots including Kolache Republic have popped up on the High Street border of the Brewery District and German Village. The addition of the Cbus Circulator (a free bus which travels between The Short North, Downtown and the Brewery District) is bringing in more people to explore the area. History lesson concluded I’ll now set the table with a sampling of the food and drink available. Not content with just one Cerviche, Arepazo offers five or more made fresh everyday including Ohio Cerviche made with Walleye and Ohio Sweet Corn. 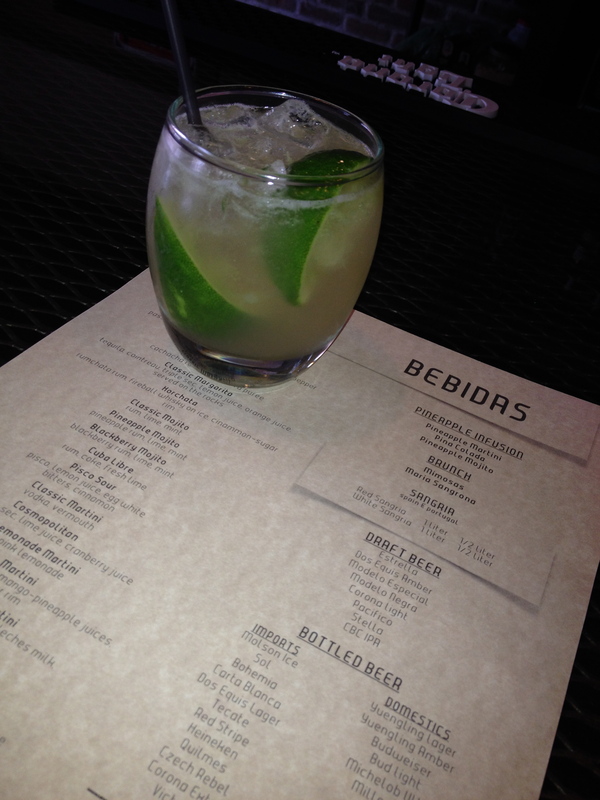 In the cocktail department, the staff behind the bar know what they are doing whether mixing a Mojito, Margarita or Caipirinha. Mix in some Sangrias, Mimosas and Pineapple infusions to the lineup and you won’t find it hard to opt for an alcohol inspired siesta some afternoon. Since this location is designed for more than just dinner, the menu also offers small plates / tapas for those that are looking to linger around for people watching or to hop from place to place in the Brewery District. 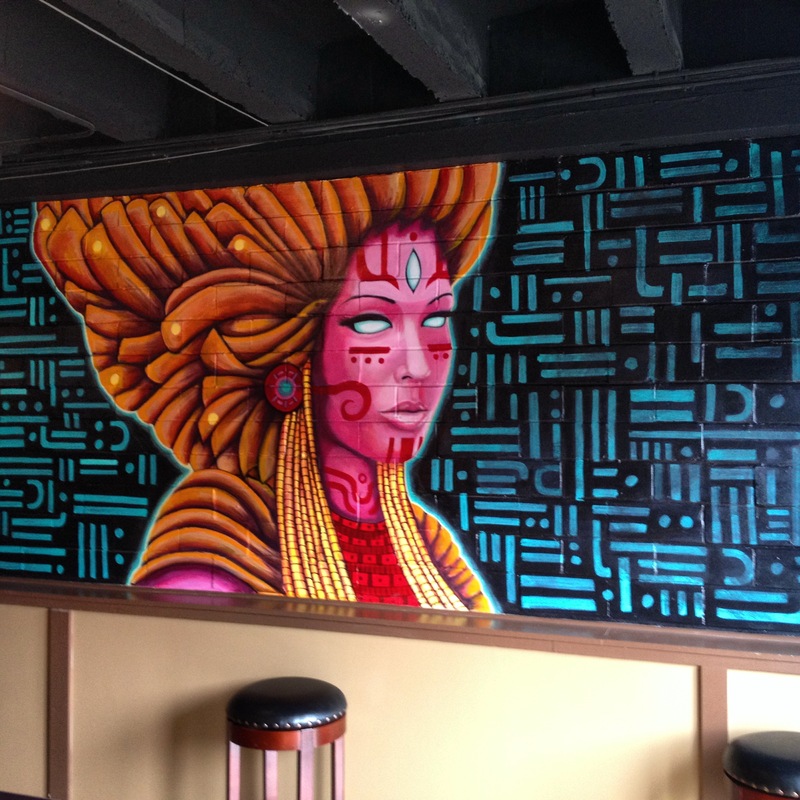 (What may be) Mayan inspired murals will keep an eye on you while you look over the menu trying to decide what to order. 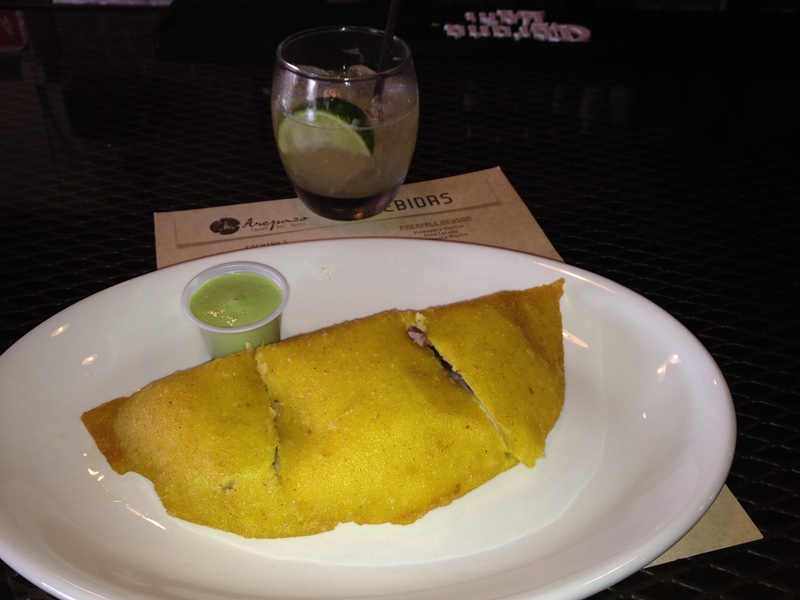 The two Arepazo standbys – Empanadas (consider this a stuffed, fried dumpling) and Arepa (the namesake corn cake which inspired the name of the restaurant) are well represented. You can see my Arepa sandwich below. 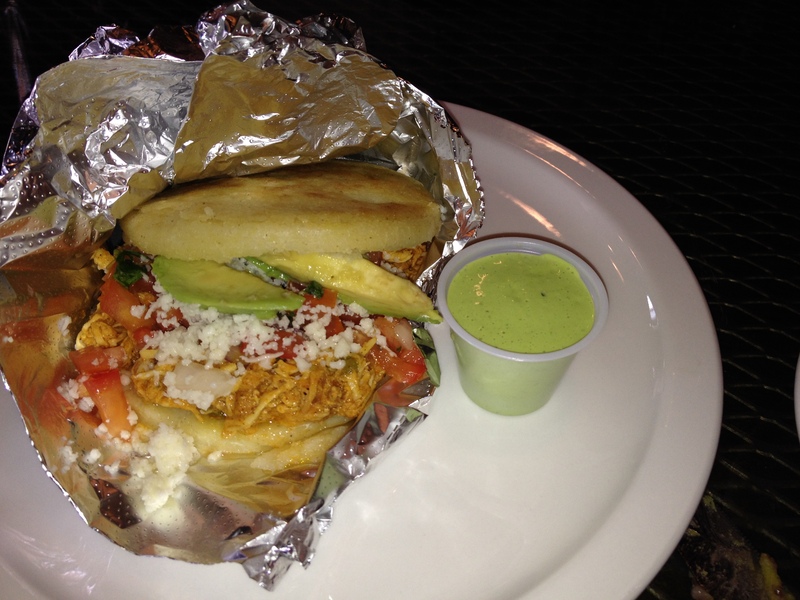 It is easy to decide to head to the German Village / Brewery District El Arepazo location. You are supporting a local business while eating a great meal and fueling the rebirth of the Brewery District. This entry was posted on September 29, 2014 at 5:46 AM	and is filed under cocktails, restaurants, wine. Tagged: El Arepazo. You can follow any responses to this entry through the RSS 2.0 feed. You can leave a response, or trackback from your own site. Thank you so much for this great words CMH gourmand! Why no mention of the executive chef? I don’t know the executive chef. But I can say – they did a great job with staffing – all have been top notch so far.